Those of you who have been around these parts for awhile may remember that Jonathan and I actually met while we were rock climbing. Jonathan was big into climbing in those days and I was working at a local rock climbing gym (WOOT!) 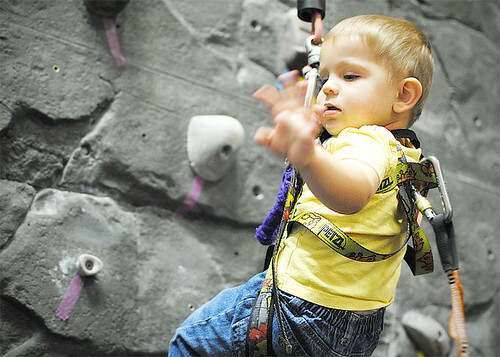 so you could go as far as to say that climbing is in the toddler's blood. After all, there has to be a reason why he enjoys scaling his closet shelves, right? 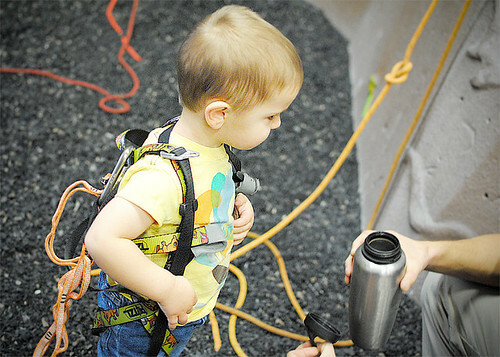 Braving the chilly weather and the fact that encouraging the toddler to climb on things in an indoor setting is just bound to backfire on us drastically, we loaded up our family of four and a ridiculous amount of gear and headed down to Vertical Endeavors. We (meaning the toddler and Jonathan since I was harnessed into the Ergo which was holding Evelyn) got strapped into our gear. 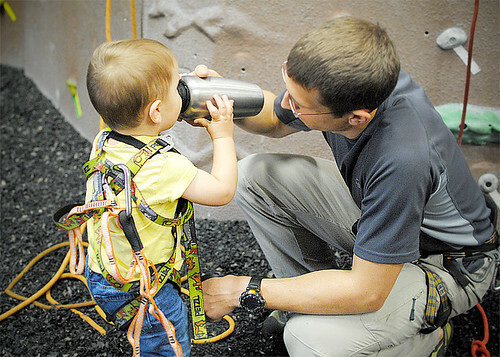 The toddler had a little time experiencing an auto-belay system and hearing Mama and Daddy praising indoor climbing, a far cry from the words that come out of our mouths when we see the toddler walking around the ledge that borders his bedroom window. There was a water break with Daddy. And the toddler was even gracious enough to toss a little wave down toward the camera. And then there was The Meltdown. This was no mere tantrum; this was the kind of screaming meltdown where all of the non-parents in a ten-mile radius are stabbing you in the eye with their death glares. It was also the kind of meltdown where any parent in the vicinity is ready to give you an unsolicited hug because they've been there too. 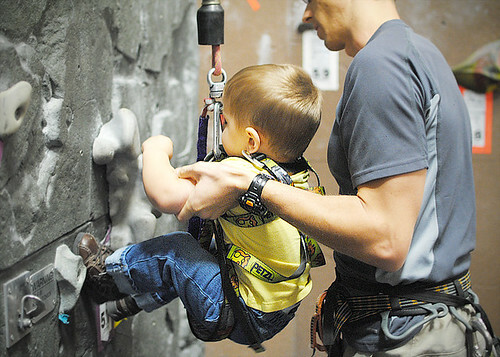 So a mere fifteen minutes after the toddler was introduced to all type of rock-climbing awesomeness, the kids and I were on our way to a nearby McDonalds to grab lunch so Daddy could climb for an hour before we had to be to our next destination. The moral of this story: don't take your toddler anywhere near naptime.